We were very excited to receive an email to explore the world of Little Passports with a 3-Month gift subscription. If you are not familiar with Little Passport, it is a monthly subscription aimed at children between the ages of 3 to 10 years old. 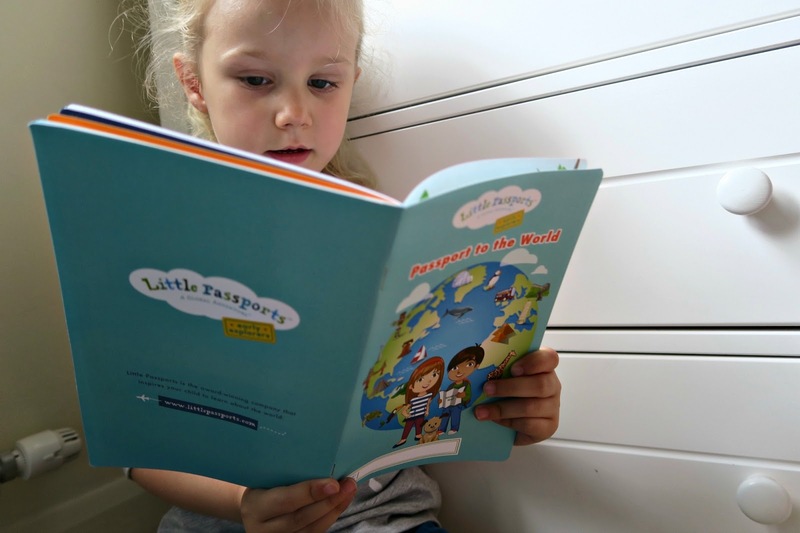 Originally launched in 2009 by two moms (Amy and Stella), there is currently three different subscriptions packages available for the UK children. There is "Early Explorers" aimed at 3-5 years olds and each month explore different world themes like: music, oceans, dinosaurs, world coins and celebrations. 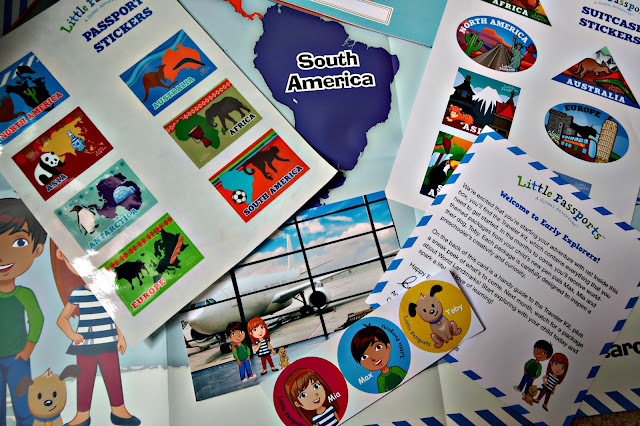 There is also the "World Edition" aimed at 6-10 years olds and will be sent a package about a new country each month with souvenirs and hand-on activities. NEW "Science Expeditions" aimed at 9+ years old now available in the UK. The sign-up process was extremely easy and I was notified by email when packages were shipped. 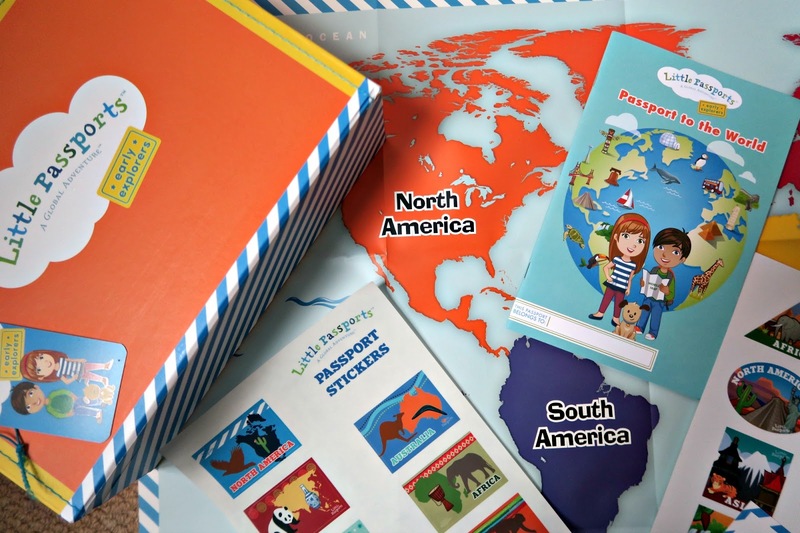 The first month of "Early Explorers" package contains the fun orange suitcase, wall-sized map, 20-page activity booklet, luggage tag, postcard, passport and suitcase stickers. There is also a "welcome letter" from Max, Mia and Toby the Dog. Little Ladybug (LL) immediately wanted to decorate the orange case with the suitcase stickers. We were able to use the stickers as starting point to take about the different continents and the animals that live there. She knows that Grandma and Papa live far away in America but by using the big map she was able to see where in the world they live compared to England. She has friend that has grandparents that are from South Africa so we also discussed Africa and the animals that live there. 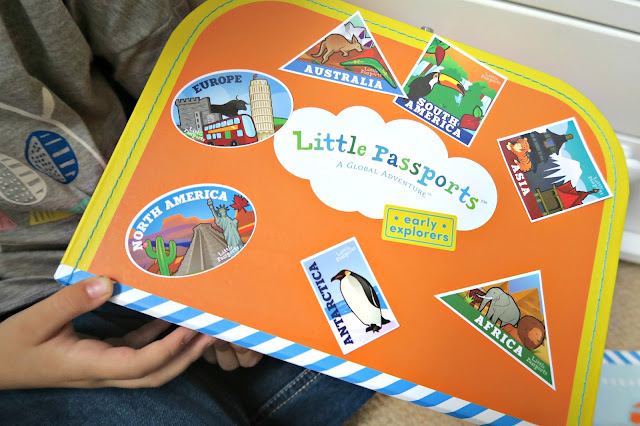 Once she was finished covering the suitcase with stickers, she started looking the passport book. The book shares the travel adventures of Max, Mia and Toby. There are the passport stickers to put in the book and other activities to teach your child about the different continents. You can purchase this for your child or would make a great gift for your child's friend or relative. Perfect gift for grandchildren, nieces or nephews. Subscriptions are available in Monthly, 3-Months (gift), 6-Months and yearly subscriptions for both "Early Explorers" and the "World Edition". It is very easy to purchase a subscription as gift. You simply need their address and an email address for the recipient's parent. The recipient's parents will get an email notifying them that their child has received a "gift subscription" from you or your child. Every month, they will be notify that a new package has been shipped. The packages are shipped from USA but arrived within a week. You will get a renewal notice before the last package has shipped. 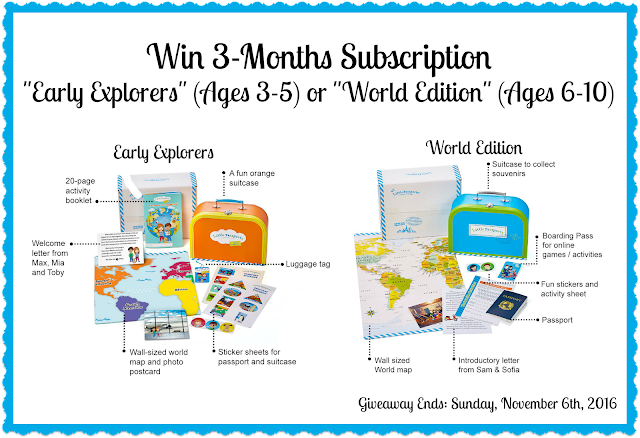 We are very excited that we are offering our readers the opportunity to win a 3-Month Subscription to "Early Explorers" or "World Edition". This would be perfect gift for Christmas or gift for your favourite Little Explorer. Giveaway ends on Sunday, November 6th, 2016 at 11:59 PM (BST-London). -You must enter via Rafflecopter. Winner's entry will be checked to ensure fair entry. -You must reside in the United Kingdom. -You must be 18+ to enter or 13+ with Parents' Permission. -Winner will have 2 weeks to claim prize before the prize becomes null and a new winner is drawn. You can also sign-up for weekly emails with craft or science activities. Do you want to how to make elephant toothpaste or learn about "9 Incredible Schools from Around the World"? 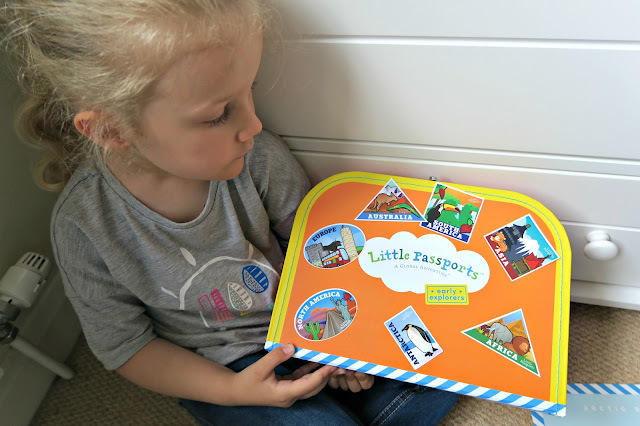 There is lots of interesting ideas and learning about on the Little Passport Blog. The next couple weeks, we will also be sharing with you the "Souvenir Picture Book", introduce you to "Toby" the dog and sneak peak at "Landmarks" and "Music" themed packs. I would want the Early Explorers set for my 4 year old. I've been wanting to try Little Passports for over a year now. World Edition for my 5 (nearly 6) year old! My 7 year old daughter would love the World Edition as she is interested in travelling. world edition would be fantastic. Would love the world edition please. I'd love the World edition for my great niece. thanks you.